Let’s face it, exercise is a tough thing to do for many and some people become reluctant to some extent because they don’t see the fun in it. But who doesn’t love water? Our daily encounter with the shower makes us so refreshed and joyed and water aerobics takes this to another level. Water and its refreshing touch and splash sounds reduce the exercise fatigue and makes this type of exercise many times more enjoyable. The environment created by water is smooth, relaxing, less straining and it makes the whole process fun. With all the other people, it makes for an enjoyable environment with all the new friends and socially friendly experience. Workouts in the land puts the whole body weight on our joints and this leads to a higher levels of impact. The water buoyancy helps to absorb this pressure of our body weight and the impact gets lowered. Knees and other joints feel less impact and this also causes less strain. For people with arthritis or other joint conditions, this is a great way to exercise. Water is a soft surrounding to do workout but it also gives more resistance. In an aquatic environment, the whole body has to work which means it is a type of complete workout. The various kinds of cardio activity, own body weight, additional weights (if somebody uses), water volume, buoyancy and strength exercises can burn up to 400-500 calories in an hour, which is very good considering the time spent. The water resistance gives additional comfort to the joints during exercise. The pressure is relieved on the joints with hydrotherapy and other water-based therapies as the studies show. This is very helpful for people with arthritis and joint pain. supporting manner. Regular water exercise greatly reduces anxiety and other chronic physical illnesses.Water is a relaxing element. It soothes the body, touches the skin and invigorates the spirit with positive feelings. It keeps a person cool, calm and relaxed. Studies have shown that weekly water aerobics makes a person feel better both physically and mentally. It helps and improves the functionality of cardiovascular and respiratory systems due to increased blood flow through cardio, similar to running and cycling. The same moves done in the land is more difficult to do in water due to resistance and that makes the body work more and burn more calories. This, in turn, builds up the body and develops the legs, arms, shoulders and body core. These are only some of the major benefits of water aerobics and water-based exercises. Exercise is recommended for most people who have a fit enough body to do it. They can also opt for water aerobics experience the difference. It’s a wonderful experience and you’ll love it with all the benefit it brings to the table. 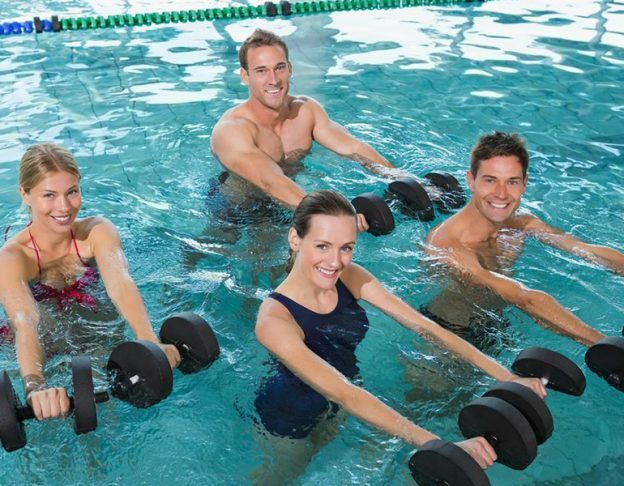 If you’re interested, look for a water aerobics centre in your locality and get enrolled. You won’t regret it.